We caught up the fantastically talented Natalie Burn to talk about her latest feature The Executioners. When four friends go on a retreat to a secluded lakeside cabin, they soon realize they’re not alone. Masked intruders try to take them hostage, but as they fight back, the friends get a taste for something more than the will to survive. Will their fate be as victim or executioner? Recently Natalie Burn starred in ‘Awaken/Left to Die’, a feature she created and produced, co-starring Darryl Hannah, Vinnie Jones, Robert Davi and Edward Furlong. Ms Burn has also enjoyed key roles in ‘Expendables 3’ with Sylvester Stallone, Arnold Schwarzenegger, Antonio Banderas and Harrison Ford, where she played the wife of Mel Gibson. She also appeared in ‘Killer Mermaid/Nymph’ with Franco Nero, ‘Criminal’ with Jordi Molla, Kevin Costner and Tommy Lee Jones and ‘Mothers’ and Daughters’ starring Sharon Stone, Selmar Blair, Courtney Cox and Susan Sarandon. 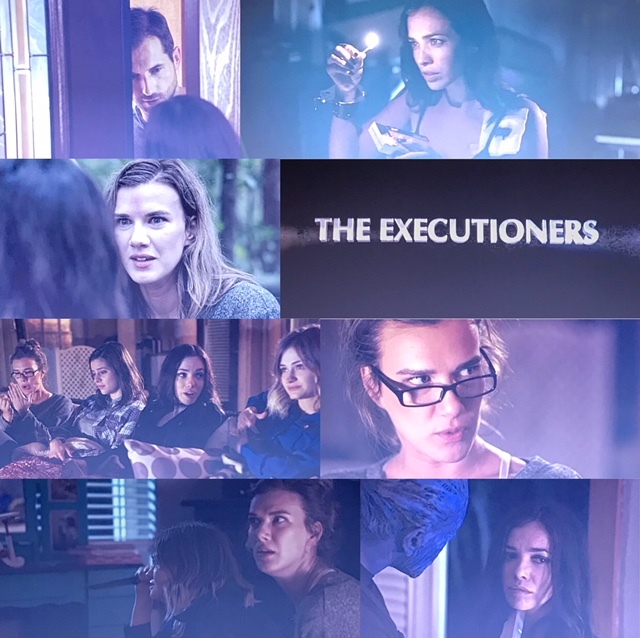 Natalie Burn (The Expendables) stars as Kay in Lionsgate’s intense horror-thriller The Executioners. The film also features Jemma Dallender (I Spit on your Grave 2), Rachel Rosenstein (Shameless) and Justin Fischer (American Crime). This exciting feature was directed by Giorgio Serafini and produced by. You have worked on an impressive number of projects from Thrillers like The Executioners to blockbusters like Expendables 3. Do you have a favorite genre to work in? I love movies, I love to create and to be honest I don’t have a favorite genre. It’s like asking me to pick my favorite dog! I think any film can be shot in any genre. It depends on one’s own interpretation on how they wish to perceive the world and what kind of messages they wish to send to their audiences. The creative world, (whether it be dance, music, art, film, etc), has come to an awakening, a renaissance even, that the “blending of genres” are being celebrated, much like the film “Get Out” and it’s success. I see myself involved in many different forms of storytelling as long as the story is true to its’ message, regardless of the genre. Awaken/Left to Die was very much an action film, do you have a stunt double or do you do your own stunts? I do most of my own stunts, thank you very much 😃. But in all seriousness, I have been a ballerina and a dancer since I was 3. To continually challenge myself, I’ve been training with the great Sensei Benny The Jet, (who played my father in the film). First time he noticed me was when I was attending the Lee Strasberg Theater and Film Institute. He said he saw something in me. It was my my drive, passion and dedication that I acquired from years of training as a ballerina that got him to pay closer attention to me. He saw the perseverance I had to go forward and not be scared to get hurt. Fear is not an attribute one should use if they want to make action movies. He told me that I could be the next big female action star because there aren’t that many in Hollywood. Having my drive and my ability to fight is rare. That’s when we made a pact: he would get to work opposite me in an action movie if I were ever get to make one. I kept my promise. We both stared in Awaken/Left to Die! Please, can you share more about your role in The Executioners? I was actually lucky to be given the script early and given a choice to pick my part. I am usually being asked to play roles that are pretty straightforward but in this film the director Giorgio Serafini saw me as a more serious actress which I thank him for, and he offered me to play the nerdy type of character. Kay is an awkward, fragile girl who’s curiosity can sometimes get the best of her. She is a writer who is currently working on her new novel while on a celebratory, postgraduate trip to a friend’s secluded house. The house holds a lot of past secrets. Kay seems gullible & absent minded at first but eventually you come to find out that there’s much more to her, hiding behind those reading glasses. Recently coming off of a first novel that bombed with her publishing deal, she attends this trip hoping that it can give her the inspiration she needs for her 2nd novel. Does she discover her muse or does the muse stumble upon her? You’ll have to watch the movie to find out for yourself. I was actually lucky to be given the script early and given a choice to pick my part. For those who haven’t seen the film, what can you tell us about it? That it’s a rollercoaster-esque psychological thriller that will keep you guessing until the very end. I think it’s a perfect timing for this movie to come out with the whole take on the women’s rights and “Times Up” support. This is definitely the film that will show that women can take care of themselves and they won’t allow men to take advantage of them anymore. But just like with any amusement ride, not everyone is going to enjoy it. Some people like thrills & unpredictability while others enjoy knowing what they’re getting into. In all honesty, this movie has many dark scenes that won’t fit everyone’s taste. For those who enjoy revenge, brutality, home invasion movies with a good twist, you’re in for a treat! This is definitely the film that will show that women can take care of themselves and they won’t allow men to take advantage of them anymore. You produce and write films as well, do you have some new projects you can share with us? I have a number of projects in the works from acting to writing to producing; all three are mediums in which I enjoy participating in the creative process. I am here to tell stories and whichever way I can endeavor in that voyage is one I love to take. Each one of them is unique and different in its own respective way. They all have a strong message that I am hoping to convey to the world. One of my projects is titled “The Lagoon.” The story was created by Dario Torres and myself while the screenplay was written by Jose Zambrano Cassella. I am also starring as the lead and my company 7Heaven Productions will be producing the movie. The film will start production later this year. It’s the story about a young, brilliant cancer researcher who is stricken with stage 4 Lung Cancer. It is terminal. In her quest to find a cure she uncovers information on a miracle cure created by a renegade doctor on the island of Puerto Rico. He uses an enzyme located in a remote area called “The Devil’s Lagoon” to create his cure. What begins as a journey to find a cure turns into a thrilling adventure in the rainforest where only the ones with a “pure heart” can survive. Another film we are currently in pre-production for through my new company Born To Burn Films is called “The Bayou”! “The Bayou” also known as “59 rows of Teeth” is going to be directed by Gary Fleder and was written by Peter Iliff. This film is going to be one of the most exciting movies I have ever worked on and I can’t wait to share more info on it soon. The principal photography will start this summer in Louisiana. With that being said I have a lot of more amazing projects on the bubble with both companies Born to Burn Films and 7Heaven Productions so stay tuned. Would you like to direct a film and if so, who would be your dream cast? I would love to direct one day and take that leap into the next creative realm. One of my very good friends Michael Pare, (both of us being Lifetime Members of The Actors Studio where we frequently see each other), always asks me “When are you gonna stop depriving the world and start directing already?” My imagination goes wild when I prepare for a role or start producing a film. It’s when I get to start asking myself “Am I too specific? Am I contradicting the director’s visions? Is it bad to have your imagination to create too much?” I catch myself collaborating sometimes with directors, as a producer, and I realize that I’m almost doing their job for them because I’m so passionate with my ideas. It’s in those moments that I know I’m going to direct soon. As for my dream cast I would love to work with people who have inspired me over the years and who I have admiration for, with some of my favorites being Meryl Streep, Gary Oldman, Al Pacino, Leonardo DiCaprio, Johnny Depp, Daniel Day-Lewis. But as the world revolves around us, our sensibilities and tastes change so there are current, new actors that also inspire me with whom I would love to work with as well. I will always choose an actor who shows me that they are just as passionate & hardworking as the art they wish to engender. It doesn’t matter if you’re an Oscar Award winner or a novice newbie, if you are talented and hardworking, I want to collaborate with you. You are in fantastic shape, can you share some diet and exercise tips with our readers? I’ve been training practically my entire life. Since learning ballet at three years young, being active has been something that just runs through my blood. It’s like breathing. I don’t have to think about it. Every human body is different and I believe that one’s workout regiment should meet that individuals needs or goals. With my workouts, they are always changing and adapting to the specific needs that are demanded of me. For instance, with “Awaken” I trained with Benny the Jet and that gave me a martial arts technique with stunt work training conducive to the character that I was playing (who had a military/fighting background). With a movie like “Downhill” I played a mountain biker with an extreme sports background, thus needing to learn the skill of off-road biking and athletic cross-training. Also, when I’m not on-set or prepping for a role I do different things to keep my gym maintenance workouts interesting and fun. Some examples include gymnastics, hot yoga, dance class, boot camp and salsa dancing. In order to keep the body in tip-top shape, it’s important to not plateau its growth and keep the muscles in a state of confusion when they acclimate to any of your workouts. Now in respects for some of my dieting advice, it’s important to know what caloric intake you need every day, (i.e. an example would be 2,000 calories a day), and attempt to reach that goal spread out the entire day, being sure to avoid eating too late, maybe giving yourself a 2-3 hour window before sleep. And keeping your carbs/protein intake during the day with your fiber/veggie intake in the evening. That kind of disciple and information are the tools that give me the wherewithal to eat and train properly. My final piece of advice for working out I say this: find what SPECIFIC goal you wish to attain. Set it & attack it with sound research. When you empower your mind with the correct fitness knowledge for your respective goal, anything is possible. In order to keep the body in tip-top shape, it’s important to not plateau its growth and keep the muscles in a state of confusion when they acclimate to any of your workouts. How can fans keep in touch with your work? I would LOVE my fans to follow my company’s progression! One of them is 7Heaven Productions, which already has a slew of films under its belt. They can go to 7heavenproductions.net and 7Heaven Productions on Facebook to find out more info. The other is a new company I recently formed called BORN TO BURN FILMS. You can check out its progress by finding the company on Facebook under Born to Burn.